2016 Gibson Les Paul Traditional T - Heritage Cherry Burst - Premuim finish. 100% mint, brand new, un-played, not been a demo in a store. 57 Classic & 57 Classic Plus Humbuckers. Classic PAF tones.Check our other listings. Layby available: www.guitarsrock.co.nz The Gibson Les Paul Traditional solidbody electric guitar gives you the construction quality, performance, and great sound offered by the Standard models from the 1980s and '90s. The Les Paul Traditional features a beautiful figured maple top, traditional weight-relieved mahogany body and a mahogany neck with a comfortable '50s rounded shape. It's loaded with '57 Classic and '57 Classic Plus humbuckers for maximum tone and ample output. Set up and ready to go for maximum playability. An un-chambered mahogany body with traditional weight-relief holes for a beefy tone that maintains the resonance of modern Les Pauls. 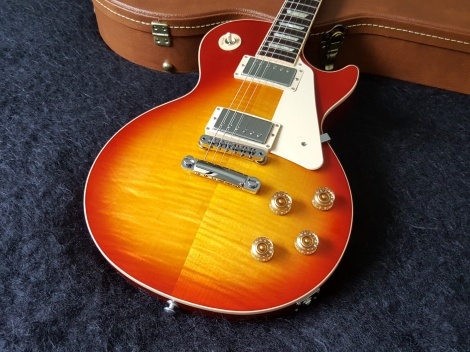 The body is capped with a carved maple top and the hand fitted neck tenon sports the rounded, C-shape profile common on the Les Pauls of the '80s and '90s. Utilizing the revolutionary Plek system - a computer-controlled set-up that carefully measures and dresses each fret, accurately measuring the height between the fingerboard and each string, virtually eliminating string buzz and providing unbeatable playability. Two of Gibson's best-loved humbuckers - a '57 Classic in the neck position, and a '57 Classic Plus in the bridge - give the Traditional the power, punch, and clarity of Gibson's legendary PAF pickups. Other traditional appointments include vintage-style Gibson speed knobs, classic Kluson-style tuners by TonePros, which offer period-correct looks with a higher tuning ratio, and a chrome Nashville Tune-o-matic bridge and stopbar.